Join us to learn chess with CJ Gregory, Master Instructor, National Champion, and Captain of the 2005 State Champions of Chess. For kids ages 7 and up! Space is limited to 16. Register online. 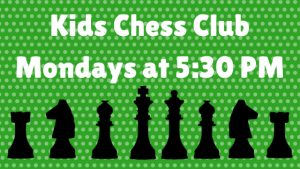 This Chess Program is funded in part through a grant from the Community Foundation of Middlesex County 365 Fund. Meets: 1/28, 2/4, 2/11, 2/25.